Cellular Sales celebrates its newest store located at 2037 N. Amidon St. This is our second location in Wichita—we love the community and people here that much! 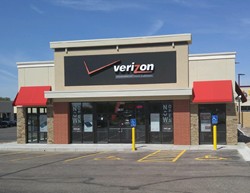 Cellular Sales, the largest premium retailer of Verizon Wireless products, has opened up a new store in the Marina Lakes Shopping Center in Wichita. The new location officially opened for business on April 1, making it one of nine Cellular Sales stores in the state and one of more than 550 in the country. Located in the Marina Lakes Shopping Center at 2037 N. Amidon St., the new store is a convenient stop for all Wichita patrons looking for the latest in technology and the best in customer service. Visiting patrons will be able to select from mobile devices, such as smartphones, tablets and accessories. Cellular Sales has always prided itself on delivering outstanding customer service, so much so that its loyal customer base has helped lay a foundation for the company to successful own and operate 550 locations across the U.S. In fact, for seven of the past eight years, Cellular Sales has been recognized by Inc. Magazine as one of the fastest-growing, privately owned retailers in the country. Headquartered in Knoxville, Tenn., Cellular Sales was founded in 1993 and has been named by Inc. Magazine as one of the nation’s fastest-growing privately owned retailers for seven of the past eight years. The company currently employs nearly 4,500 people and operates approximately 550 stores nationwide. Job seekers may visit jobs.cellularsales.com. For more information on the company, visit cellularsales.com.